Tennis, dance, swimming, paddling, gym workout, stairs—all my life I’ve been an active person, though the particular sport or exercise has changed from time to time. I wonder now, as my physical world has shrunk, if I am what I do. If so, there’s not a whole lot left of me. Now, as cancer consumes my body and I have lost more weight than I ever intended, I ask myself: how identified are we with our bodies? Who are we when our bodies fail us? When illness—or accident or age—diminish our abilities, do they also diminish us as people? No one today would call me the Energizer Bunny, as my sister and some friends dubbed me in the past. On the other hand, I know that being fit has made the journey easier. “Anything I can do to help?” I pose this question to my friend who is packing up to go home to Florida after almost a week’s visit with me. She faces her own physical limitations caused by various illnesses and a recent fall that resulted in a severely broken leg. Last week, my husband Julian and I converted the living room into a bedroom for Elaine, who barely makes it up the three steps into the house. A full flight to the upper story is beyond her at this point in her recovery. A friend in my writing class lent a folding bed. Julian turned the love seat around so it faces the bed and serves as a suitcase rack and shelf for her clothing. An end table and a Lenox lamp from other parts of the room make a fine bedside table. Good to know. If or when I can’t climb the stairs, this won’t be a bad bedroom. “Out of my way,” I say. I easily moved the zipper on the small, purple suitcase to the corner. Pushing down in the right spot to maneuver the zipper around the bend isn’t so easy, but I have the manual strength and dexterity to do it. Just as I reach for the other zipper, Elaine spots a stack of multi-colored tissue paper that she wants to take home with her. I move the zipper back around the corner that I have just navigated. Yep, it will still close with the paper. I push a blue print garment back into place and begin again. Got it. Now I tackle the other zipper from the opposite direction. Got this one, too. Together, we listen to the scratch of the zipper traveling its track to meet the first one. Done. And so am I. Though my hands are strong enough, it takes all my bodily strength to close that suitcase. With a rueful laugh, I make my way to the couch and collapse. My heartbeat seems to fill the room. How wonderful to be able to do something for someone else. It’s hard to be always on the receiving end of help. I’d much rather help Elaine than have her cook and shop and drive for me. Even with these arms that are as skinny as a child’s. No fat left anywhere on my body. I hate this feeling of wasting away. I lie here, looking at the upholstery I love, a soft floral print. I admire again the lamp, with its own floral design and purchased years before in Cleveland, where Elaine and I first met. Though acquired for a different room and different furniture, it blends perfectly here. Sort of like Elaine and me. We treasure our easy, comfortable forty-plus-year friendship in which we each do for the other whatever is needed. Gradually, my heartbeat slows and my strength returns. I lie listening to the quiet until Elaine says it’s time to head to the airport. I was always an active kid: kickball or softball at recess, riding my bike or scooter or jumping on my pogo stick after school, amusing myself with made-up ball games against the garage door, playing in the wooded ravine behind my house, running with the neighborhood gang, dancing lessons, tennis, and even walking the half mile from the public bus stop to my house on a daily basis. Not that I set out to be active; except for the dancing lessons and the daily walk from the bus stop (which I hated), I was just a typical kid at play. For the years between my retirement in 2006 and my cancer diagnosis in 2013, I went to the gym a disciplined three times a week. There I spent thirty minutes or more on weight resistance exercises, then another half hour or so on cardiovascular activities. I worked out with a trainer for thirty minutes every two weeks, so I always had new exercises and my routines never felt stale. I detested the twenty minutes I spent at home on my Nordik Trak the days I didn’t go to the gym; nevertheless, I tackled the machine faithfully and did, at least, hear a lot of good books while my arms and legs went back and forth, forth and back. There was a period of a few years when I climbed flights of stairs for cardio exercise. Counting only the upward flights, I climbed between thirty and sixty flights of thirteen steps at a time. It was perfect preparation for the trips we took every winter to someplace warm and interesting. While my trip mates groaned about the intimidating flight of stairs that would take us to the upper level of a town, I danced up them and was the first to arrive at the top. When my knees started squawking, I ditched that exercise for another. Did that limitation make me feel diminished? Not a bit—I just moved on to something else. But when I came home a year ago from more than two weeks in the hospital with a lung infection, I had to haul myself up the stairs with my arms on the handrail. Then I felt less than myself. Not able to climb a flight of stairs? Me? After all those years of practice? With the help of a physical therapist, practicing his prescribed exercises with the diligence I once attached to the gym, and with time to regain strength, I can now climb a typical flight of stairs fairly easily. This makes me question my hypothesis that we are what we do. I didn’t feel the least reduced when I stopped climbing multiple flights of stairs for exercise. So why now do I feel lessened by today’s limitations? Perhaps because I have had to change the whole pace of my life. It’s not just one thing that I don’t do; I’ve dropped a constellation of activities, from housework to gym workouts, from swimming to paddling. I can live happily if I never again do a load of laundry, but paddling is a different matter. For years, I drove around with my solo canoe atop my car all summer. Whenever the mood struck, I drove ten minutes to my favorite local paddling spot, lifted the canoe from my car, launched it, and paddled for an hour or two. Afterwards, I threw the canoe back on the car, tied it down, and resumed my day. I never turned down another paddler’s offer to help, but I was perfectly capable of handling my little red boat by myself. Now, when I think about that, I find myself tearing up. Of all the activities that I can no longer do, that’s the one that most readily evokes the sorrow I feel at my limitations. I can still paddle, but I am taking a narcotic that prevents me from driving. Moreover, the energy it would take to launch my canoe would leave none for climbing into the canoe, much less propelling it. I’ve lost the independence as well as the energy to just pick up and do my favorite activity. Now that the weather has warmed to a level that my lungs can handle, I have resumed the neighborhood walks I dropped with last autumn’s falling leaves. A thirty minute stroll on the level streets surrounding my home demands a thirty minute—or longer—nap. I wonder how much sleep it would take to recover from getting the boat into the water by myself. Energizer bunny? Not exactly. 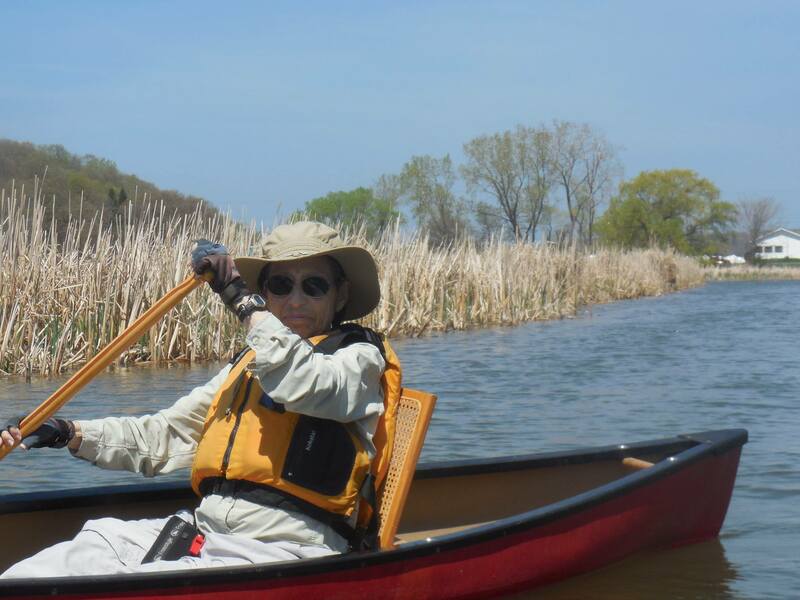 Throughout this past long, dreary winter I pined to be in my canoe. Not just any boat, but my red, 10-foot long, 20-pound craft. Finally, we are blessed with a warm, sunny Thursday on a week I don’t have chemo. After lunch, I go to the garage. My canoe is already off the rafters where it sleeps all winter and on my car. Julian searches for the tie-down ropes. I put the paddles, life vests, and my canoe seat in the car. Along the way, I find the ropes. “I think we should go in the tandem.” Julian tries one more time. I understand that he is worried about me, that he wants to take care of me, that he wants to be in a position that if my strength fails, he can take over. Exactly what I don’t want. Reluctantly, he gives in. At the postage-stamp sized park on Empire Boulevard, where Irondequoit Creek meanders into the bay, he puts my canoe in the water. He holds my hand while I step in, then quickly sit on the cane-back seat that keeps me just off the bottom of the boat. He gives a push, and I’m off. On my own. On the water. A full-size smile on my face. I am surprised that there is a stiff breeze swooshing by me, straight off the bay, from the north. I didn’t feel that wind at home. With my life jacket serving as the perfect windbreaker, it pushes me toward Empire Boulevard. Under the bridge, I watch the birds flit back and forth. While Julian arranges for his rental kayak (a sacrifice for him; like me, he prefers canoes, but this place doesn’t rent solos), I drift in front of the dock. Red winged blackbirds swoop and dive, reminding me of the essay I just read about a writing classmate’s sky diving experience. I wonder where the ducks are, but I’m satisfied to watch the smaller birds playing in the wind. The landscape is a bit strange: it is filled with the remnants of last year’s dead, brown reeds. A few young, fresh, green cattails add life to the early season view. Julian joins me and we begin paddling upstream. I set the pace: slow and gentle. No sense in using up all my energy in the beginning. I am right that I have the strength to paddle. What I don’t know is how much stamina I have, how long I will last. I have been on this stretch of water—my favorite within fifteen minutes of home—so many times that every bend is familiar. I see a swan just where I expect to, along with a couple of cygnets and a few mallards. We chat amiably with a couple who are inaugurating their new canoe, tell them where they might find a picnic spot. At one curve, I paddle hard against the current. Ten or fifteen strokes at my full strength, and I am exhausted. Back to my slow, steady pace. I recover quickly and reach a point at which it seems wise to turn back. I have paddled in 45 minutes what I used to do in 30, but I’ve done it on my own, with no problem. But I could not have done it without Julian’s help. As we approach the rental spot, I suggest that he go ahead to return the kayak, handle the finances, and drive across the street to help me out of my canoe. He arrives just in time to walk cautiously onto the nailed-together boards that serve as a pier of sorts. It takes most of his strength to pull me up and balance me as I step out. I carry my paddle and chair to the car and collapse onto the front seat. At home, I head straight for the hammock. So there, World. I can still do it. I still have strength. I can still be self-reliant (with the right kind of help). I can still enjoy the serenity of the water, the reeds, the birds. Later in the season I’ll see turtles sunning and hear the frogs’ deep bass music. But not today. Today I am satisfied—delighted, in fact—with a clear blue sky, warm sunshine, trees just beginning to leaf out, last year’s desiccant cattails. When asked a few months ago by a friend if there was one thing in particular I wanted to do, that she could perhaps help me do, I found myself answering through unexpected tears that I wanted to go out in my canoe at least one more time. And now I’ve done it. My physical strength is less that it used to be, but it’s not gone. My cognitive functioning doesn’t seem to have slowed anymore than others in my age cohort. And that brings me to Descartes. I first encountered his cogito ergo sum, “I think, therefore I am,” in college. This bit of philosophy made perfect sense to me. I can think of no time when I was more full of myself and more certain of my mental prowess than during my university years. And then life moved on, and I discovered that the smartest people weren’t necessarily the most successful or the happiest. Maybe there is more to us than our brainpower. In college I wrote a paper in which I came to the certainty that being in the image of God means to be creative. Is it perhaps my creativity that makes me me? The book I wrote is as much an expression of creativity as a painter’s portrait or a baker’s wedding cake. We certainly cannot create whole worlds, ex nihilo, like God. But we may be most Godlike when we are creating. Physical activity, thinking, creativity—which, or what combination, of these makes me me? And does the attenuation of any of these make me less me? Or do I carry my “me-ness” in a spirit, an attitude, that supersedes any of these? Perhaps I should rewrite Descartes to say “I am grateful, therefore I am.” Grateful that I could once be so active. Grateful that I can still walk around the block. Grateful that my children and grandchildren—who know far more than I do about a host of subjects—still turn to me for advice. Grateful that I still take pleasure in the hard work and creative exercise of writing. And most of all, grateful that I have outstanding doctors, kind and skilled nurses, and a platoon of friends ready to march with me. Last summer, when our youngest grandchild came to Rochester from Los Angeles for her eleven-year-old “alone” visit, I was not able to take her canoeing or hiking every day as I had done with her older siblings and cousins. She spent more out-of-the-house time with Grandpa, and she and I occupied ourselves with more homebound activities. She had a fine time, but I felt cheated. I had always wanted to demonstrate for my grandchildren the art of growing old actively, vigorously. I wanted her to experience with me my love of the out-of-doors, especially water and woods. A note that grandson Sam, 21, gave me recently suggests that perhaps I am teaching these nine descendants something more profound. “Grandma,” he wrote. “You’re so cool! You constantly teach me how to be alive!” I have taught him that? How unexpected! That’s bigger than I ever dreamed of doing. Diminished? Devalued? Only if I measure myself against my former physical activity. Not if I keep my illness in perspective and realize that I am not my cancer. I can think of no greater gift to my grandchildren than to teach them, at any and every age, how to be alive. Grandma, this past weekend I was on an NCSY shabbaton, and the theme was “Superheroes.” Most of the learning sessions revolved around what makes a superhero, and how to find one’s superheroes. Grandma, the whole weekend I kept relating the lessons to you: you are my Superhero. You teach me to be alive, you teach me how to be grateful, you teach me to live with enthusiasm in the most trying of circumstances. You also teach me how to write better, which is not something to be sniffed at. Grandma, I love you so much, and even if we don’t see each other at the bat mitzvah, know that you are a Superhero who has made a super impact on my life. So important….. Thinking of you…..
BJ, reading Kinneret’s post says it all. You have taught your grandchildren incredible life lessons, not just that you are active, enthusiastic or grateful, but the importance of listening, what it means to be generous, and what it means to receive unconditional love. You will always be a Superhero to them and to many of us as well, but the gifts you’ve given them are profound. They will live with them their entire lives and, with God’s help, share them with the next generation. Such a lovely essay. Your writing is easily read, beautifully constructed and I appreciate your openness. How fortunate your children and grandchildren are to have you as an example of how to live, of doing big things in one’s life. Thank you for sharing your thoughts! Love Kinneret’s note! Clearly an independent-thinking young lady. I guess it’s genetic. I always read your stuff and think, “She is so sensible.” Everything you write always makes perfect sense to me. More than that, you manage to answer in your musings the questions that I might think of. I find your writings to be affirming because they are so grounded and real. Thank you for that. The beauty of your writing is a reflection of the beauty of the person you are, BJ. and has already reached 174 readers. I am grateful for allowing us to co-publish your work that is by now so loved and appreciated by a wide range of people who have become your followers. Just reread your essay, and was stirred again by powerful words that you had written. I was reminded of the many wonderful things that we have in common, and how much I have learned from you. It included the ridiculous ” The new toilet matches the 55 year-old bath fixtures” to the superbly relevant, important: ” Mother,” “Daddy”. I am grateful for many of the things that you have said to me, and written . I am grateful for your love, which I return to you in kind.